Every MBA aspirant has a dream to crack one of the Top B schools and start the journey towards success. After many attempts in CAT/XAT and many other entrance exams, I could not convert to any of the B school of my choice. I had lost all hopes of doing my post-grad for this life at least. 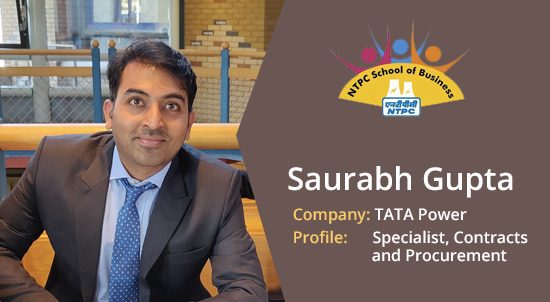 All of a sudden with god’s grace and Tata Powers’ opportunity arena, I was fortunate to get selected for 15 months executive PGDM programme at NTPC school of Business (NSB). Not all are privileged to have this prospect to live the college life once again. Overall, it has been an enriching experience and one of the best 9 months of my life. However, it has been a bumpy ride of cases, discussions, quizzes, presentations and fun, of course. When I look back, there is quite a lot that I have learnt. When I started life at NSB, I was not so positive on the learnings and future prospects in terms of knowledge enrichment. As the course unfurled, I found that visiting faculties on board were best of the faculties from institutes like IIT Delhi, IIMs and MDI. In addition to this, we were delivered lectures from Industry veterans, established independent directors and guest lectures from Joint Secretaries and IAS officers. As the trimester went on, I could see the visible change in my perspective and understanding. As we moved to the 2nd trimester, we were already cautioned by seniors about the hectic schedule and toughest phase of MBA programme. Jan, Feb and March were the months which actually took away the breath from each one of us. During 2nd trimester, we learnt about the association of IIM-Ahmedabad and Cambridge Judge Business School with NSB. Our whole class was on cloud nine. People die to get associated with these two premier institutions and this came to our batch in the form of blessings. The third trimester was mostly the taste of learnings from IIM A professors. After the learning experience from IIM A Profs, I felt that yes it’s the premier institute given the quality of education it imparts and the totally different teaching style. All professors adopted the style which forced our brains to bring out the untapped potential. They believed in imparting learnings through case studies and they actually did the surgery of given cases. At first, they used to explain the entire framework of the case study step by step and gradually they used to converge it so nicely that each one of us could appreciate the actual learnings. They believed in engaging students off class i.e. hostels/ dorms so that classes can be short and precise. I see that my way of reading the cases and its interpretation has completely changed. After IIM-A association, level of studies and methodology has been lifted to a great extent. Course content and electives have been enriched to suit the requirement of executives and are at par with many other premier good B-schools. Learning has given me different outlook and dimension to ponder and do the analysis to the extent of paralysis. Presently the whole batch is excited to experience Cambridge leadership programme, a part of our international immersion study tour. B school has given me a new perspective, has enriched my knowledge and Network for execution. When you are in a B-school, you have to keep yourself going, stay calm & composed. Don’t let anything affect your studies. Believe me, this is just training you for the corporate world and your own endeavours. One should not overburden themselves with a ton of academic and extra-curricular activities. Choose what you want to do and do it well. Don’t try to do everything or else you will burn out. Along with studies, as a stressbuster, I have passed a good amount of time playing badminton and snooker. On top of it, the canteen is the place we chilled out with group buddies pulling the leg of each other. Before every exam, one game of snooker/billiards was a must to secure good marks in the exam. (haha…) Yes, we have clouded ourselves with this superstition. So far it has been an amazing journey and experience of Knowledge, Information, discussions and fun. It’s the best time to contemplate and create a career plan. Life is going to get a way lot tougher post this course.